This easy No Bake Energy Bites recipe is a healthy snack that is ready in just 15 minutes. You can even customize them to fit your taste! 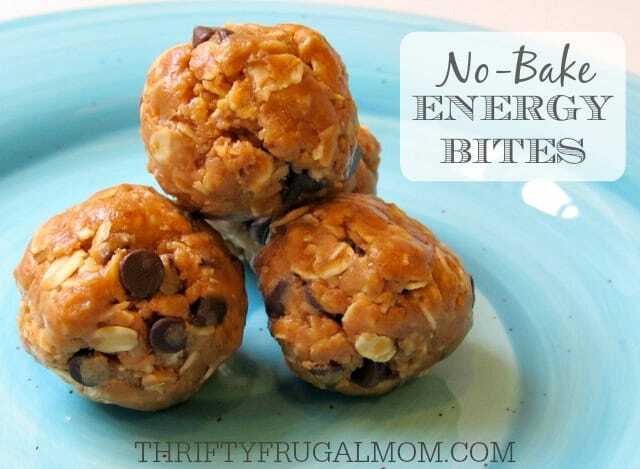 These No Bake Energy Bites became my go to snack when I was pregnant with our second child. They were the perfect thing to eat when I was craving something sweet because they satisfied me and yet were still relatively healthy. Definitely better than the Oreos or ice cream that I often felt like eating! I love how easy they are to mix up and the fact that you can customize them to fit your taste is just fun. There really is no excuse not to make them. Unless you are like my sister-in-law and don’t like peanut butter or something. Otherwise, go and mix these little babies up and be ready for that next sweet tooth attack! 1. Combine peanut butter, honey and vanilla; add remaining ingredients. 2. Add more peanut butter if needed to get a good consistency. 3. Refrigerate for 30 min. then roll into bite-sized balls. 4. Keep refrigerated. Can also be stored in freezer. Hello, ThriftyFrugalMom! So I just came across this recipe via Pintrest, and after taking a gander at your site I can tell this is definitely for me! My hubby and I are starting our family come March, and this will be a great source of information- thanks! Okie, back to the recipe! I am probably the only person on the planet that dislikes peanut butter...big time. What would you suggest using to replace of peanut butter? These little bites would be perfect for my busy day! Thanks again! Almond butter, hazelnut butter, sunflower seed butter...any nut butters would probably work. What about almond butter instead? My daughter doesn't like peanut butter that much so I do half and half for her. Also maybe cashew butter. Oh, that should totally work, Jen! I would think that any nut butter would be okay. It may take a bit more or less depending on the consistency of the nut butter, but I can't imagine it would vary that much. Love how simple this is. For the kids I may add a scoop of pediasure powder (we tend to have picky eaters sometimes so they would get a protein high+ other essentials lol) and my own batch see how putting some protein powder in it would turn out. Oh, that's a great idea! Never would have thought of it but I can't imagine that it would work well. Oh I love a simple recipe. I saw your link on the Mom 2 Mom Monday Link-up. You and me both, Meaghan! This recipe sounds so delicious!!! I'm hoping to try to in the next several days. They look very healthy as well. I think you all will enjoy it, Rebekah! And the neat thing is, it's the type of recipe that you can tweak to fit your preferences and taste pretty easily. We love no bake energy bites! They are so good! I'll have to add cinnamon to my recipe! These sound so good and easy to make, I'll have to try them! these look so great!! need to try these, i think my kids would gobble these up! Yes, my kids love them and they're such a fun kid snack- I'm sure you little ones would love them! I love these for my afternoon slump. I make them with raisins and sometimes pecans. My recipe doesn't have vanilla and I can't wait to try that addition. Pecans would be a yummy addition! And I think you'll like the extra flavor the vanilla gives. In my opinion it kind of makes all the other flavors pop a bit more. I love energy bites, and your recipe is just a bit different, thanks for sharing it!!! Have a great week. They're such an easy treat, aren't they? I just made these (so easy!) for my daughter who has been having digestive issues and had lost some weight. Her doctor recommended more fiber and of course more calories. These are perfect! Thank you thank you thank you! You are so, so welcome, Jaze! So glad to hear that these were a help! And hope your daughter is back to excellent health again soon! In place of the wheat germ, flax seeds, etc., do you think chia seeds would work? I think so! I haven't used chia seeds just a lot, but from what I think they would work as a substitute. The only possible issue that I can think of is that the moisture from the peanut butter and honey might cause them to "soften" and become gelatinous, but I really don't think it would be enough moisture to make it a huge issue.